That said, the Republicans have advantages of their own. While some of the Republicans’ gerrymandering advantages have been reduced through court-ordered maps in Florida, Pennsylvania, and Virginia, the overall House map still leans Republican — the median House seat measured by 2016 presidential margin, NE-2, is about four percentage points to the right of the national margin. Republican gerrymanders in states like Michigan, North Carolina, Ohio, and Wisconsin endure (though a court order forced a modification in the Tar Heel State), making it challenging for Democrats to net House seats in these competitive states. Democrats do benefit, on balance, from an unusually large number of open seats. At least 59 districts — 39 held by Republicans, 20 held by Democrats — will not feature an incumbent running for reelection, the second-highest total of open seats in the postwar era. Democrats will need to net a substantial number of seats from the open districts, probably a third or more of the 23 seats they need to flip the House. 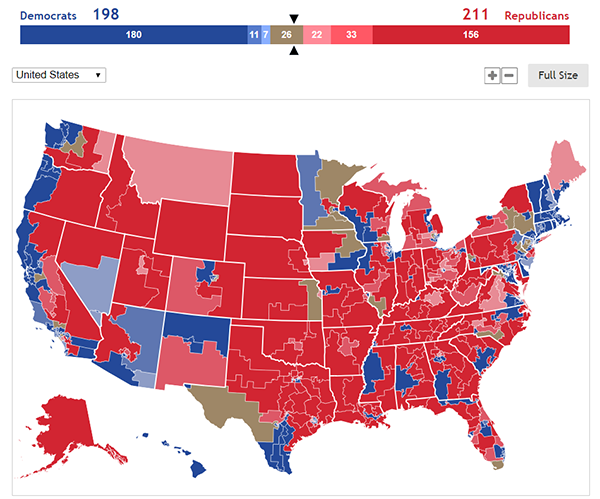 The reason is that the Senate map is so bad for Democrats. Even though the party that doesn’t hold the White House typically makes up ground in the Senate, just like in the House, the non-presidential party has arguably never been so disadvantaged on a midterm Senate map as the Democrats are on this one. That’s particularly true if one counts the two independents running for reelection this year as Democrats, which is reasonable considering that Sens. Angus King of Maine and Bernie Sanders of Vermont caucus with the minority party. Thus, Democrats are defending 26 of the 35 Senate seats being contested this year, including 10 seats in states that President Donald Trump won in the last presidential election. If one uses such seats as a proxy for the most vulnerable Democratic-held Senate seats — a reasonable metric — then almost all of the most vulnerable Senate Democrats are on the ballot this year. The only two Trump-state Senate Democrats who are not on the ballot this year are Sens. Doug Jones (D-AL) and Gary Peters (D-MI). Peters convincingly won even in the bad Democratic year of 2014; Jones should have a very difficult race for a full term in 2020 after winning a special election last December. Meanwhile, there are only three Republican senators that hold seats in states Hillary Clinton won, and of those, only one — highly vulnerable Sen. Dean Heller (R-NV) — is on the ballot. The other two are Sens. Cory Gardner (R-CO) and Susan Collins (R-ME), both of whom are up for reelection in 2020. 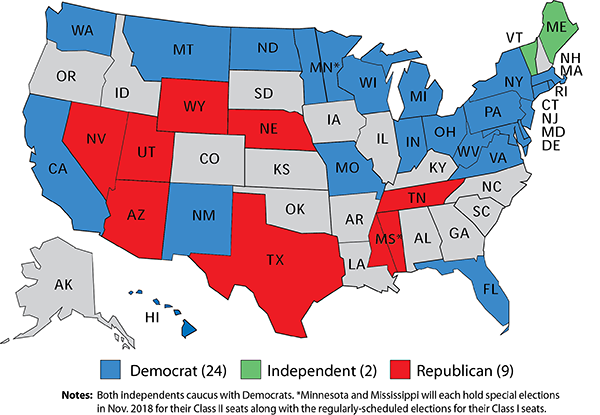 That Democrats can hold a 12-3 edge in “crossover” state senators and not hold the majority speaks to the Republican lean of the Senate: The median Senate seat by presidential performance would be the average of Arizona and North Carolina, or a seat that Trump won by about 3.5 points, so about 5.5 points to the right of the nation in terms of the most recent presidential results. That remains a heavy lift for Democrats. At the same time, none of the Democratic Senate incumbents have worse that 50-50 odds. But, as one Democratic source stressed to us earlier this cycle, even if the Democrats are having a good cycle, most of these races will still be raging in October. 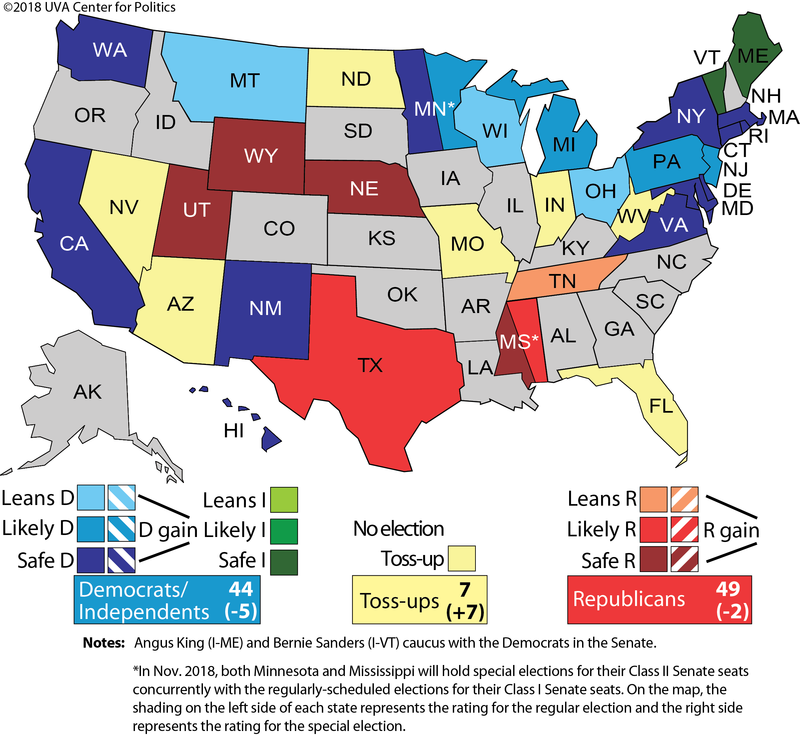 If Democrats truly have a good chance to take the Senate, that might not become clear until very late in the cycle. Conversely, the Republicans could net seats, which would give them a buffer when they defend lopsided, Republican-dominated Senate maps in 2020 and 2022. Republicans hold a 33-16-1 edge over the Democrats in state governorships. Of the 36 governorships on the ballot this year, Republicans are defending 26 and the Democrats are only defending nine, or the exact opposite of the level of party exposure in the Senate. An independent, Gov. Bill Walker of Alaska, is also on the ballot. Because of the level of exposure for Republicans in the governorships, it would be shocking if the Democrats didn’t net at least some governorships. Our current ratings show them favored to pick up three: Illinois, Maine, and New Mexico. Alaska is a Toss-up and probably represents the Republicans’ best chance to pick up a governorship. 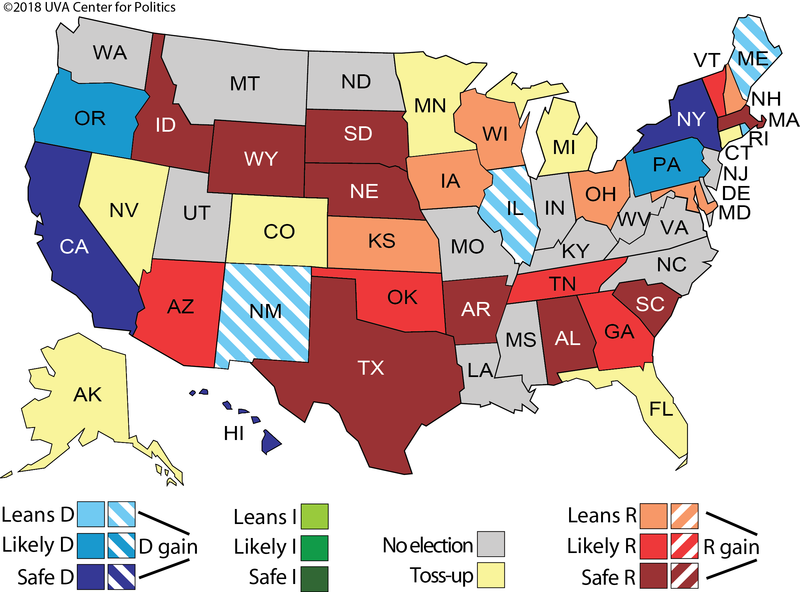 There are six other Toss-ups, all of which are open seats: Democrats are defending Colorado, Connecticut, and Minnesota, while Republicans are defending Florida, Michigan, and Nevada. We have previously suggested that the winner of this year’s gubernatorial elections probably will be the party that wins a majority of these five big states that appear competitive: Florida, Illinois, Michigan, Ohio, and Pennsylvania. Republicans currently hold all but Pennsylvania, where Gov. Tom Wolf (D) remains a favorite over the newly-minted Republican nominee, state Sen. Scott Wagner. Democrats also will almost certainly pick up state legislative seats this year after losing so many over the course of Barack Obama’s presidency (close to 1,000 total). The Democratic losses under Obama were large but hardly unprecedented: On average, the presidential party has lost more than 300 state legislative seats nationally in postwar midterms. That sounds like a lot, and it is, although there will be 6,069 state legislative seats on the ballot this November, the lion’s share of the 7,383 total, according to Ballotpedia. 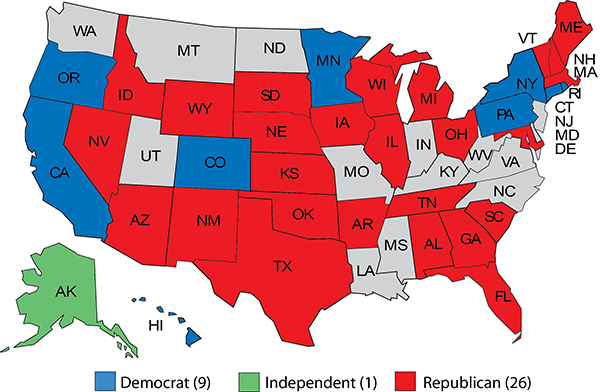 Still, the Republicans gained so much ground in state legislatures in the Obama years that the Democrats may have a hard time picking up many state legislative chambers (Tim Storey of the National Conference of State Legislatures noted some of the chambers in play for the Crystal Ball earlier this year).